The line-up of fourth round matches for Monday is sensational with one of the highlights being the Wimbledon finalists from the two previous years, Angelique Kerber and Garbiñe Muguruza, going head-to-head. Shockingly, Kerber vs. Muguruza is only good enough for Court No.2 on Manic Monday. Kerber’s third round win over Shelby Rogers was not a vintage performance by any means, but the fight that she showed to come back from a set and a break down and her celebration on match point was encouraging to see. Kerber saved a break point down 4-6 *2-4 *30-40. The world number one played a superb second set tiebreak where she stepped up her level and went after her groundstrokes to force a deciding set. Kerber needed seven break points to go up an early break in the third set, but she soon lost her advantage, becoming passive again with Rogers dictating rallies and Kerber resorting to reactive defence. Kerber even faced a break point at *2-3 *30-40 with Rogers going way long. This seemed to charge Kerber into life who began using the drop shot, which was really effective. Kerber’s serve frequently looked laboured, but she defended well behind it and found some great serves when serving for the match. Kerber’s stats were pretty decent with 25 winners to 14 unforced errors. The world number one has won three matches at the same tournament for the first time since Monterrey and is into the second week of Wimbledon for the fourth time in her career. Muguruza has gone under the radar for three rounds but that’s about to change. The Spaniard produced another brilliant performance to defeat Sorana Cirstea, 6-2 6-2. The Romanian player didn’t play badly at all, in fact she produced a handful of smoking winners. Cirstea just came up short with her tactics often going for a little too much, as a result of Muguruza’s fine play, or not quite finding the right shot to finish a rally. Muguruza built the points well behind her serve and also looked to be aggressive and come forward when the chance arose. Muguruza won 78% of points behind her first serve and won 11 of 14 net points. There was a potential turning point in the second set for Cirstea as she was serving at *1-3 – the Romanian player saved seven break points, to the frustration of Muguruza, but couldn’t hold on for the eighth. Muguruza secured the double break and then held her last two service games, finishing off the match in just 70 minutes. 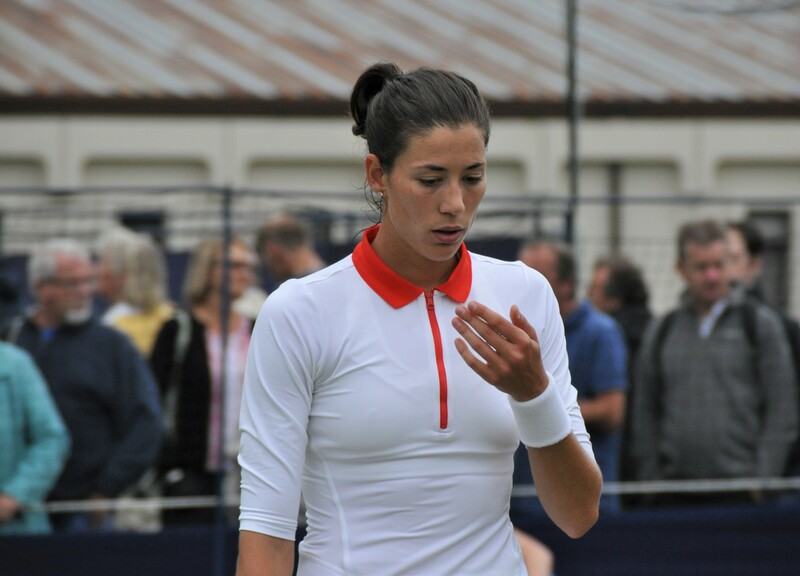 All in all, an excellent first week for Muguruza with the memories of her second round loss to Barbora Strycova in Eastbourne well and truly behind her. Head-to-head record: Muguruza leads Kerber, 4-3 in their head-to-head. Muguruza has won their last four matches but the pair haven’t played since the WTA Finals in 2015 when Muguruza won, 6-4 6-4. In their only match on grass, Muguruza beat Kerber, 7-6(12) 1-6 6-2. The first set of that match remains one of the best sets of women’s tennis I have watched in the last few years and it was so good, I wrote a entire post about it HERE. Interesting stats: The stats from Kerber and Muguruza’s first three rounds show that the pair are almost level for percentage of first serves in. Muguruza has won a higher percentage of points behind her first serve (76% to 67%) and Kerber has won a higher percentage of points behind her second serve (53% to 50%). Kerber has hit more winners than Muguruza, hitting five more with each round, although she has played an extra set. Muguruza has kept things really tight this year with a total of 50 winners to 30 unforced errors. The most impressive aspect of the Spaniard’s game through the first three rounds has been net points – Muguruza has won 28 of 35 points coming forward. Final thoughts: Their last match at Wimbledon automatically makes me excited for this clash and it will be on the same court! Kerber has been solid so far this tournament but will likely need to be a little bolder if she is going to advance deeper in the draw. It was a similar situation for Kerber last year at Wimbledon though where she upped her level from the 4th round/QF stage. Confidence is key for Kerber considering how her year has panned out and the win over Rogers will surely have helped in this department. Muguruza’s Wimbledon campaign has been surprisingly straightforward and she is arguably playing some of her best tennis of the year so far. The overwhelming sense I have had this year is that, while battling hard during many matches, Muguruza has become more and more passive. This week, she seems to have that aggressive edge back and is looking to come forward and take the ball out of the air with conviction. This is what she did so well to reach the final of Wimbledon back in 2015 when she beat Kerber, Wozniacki, Bacsinszky and Radwanska. There will always be up and downs but if Muguruza is going to win big, in my opinion, this is where she thrives and her game is at its most dangerous. Muguruza hasn’t really been tested yet this week but this has been a decent match-up for the Spaniard in the past. While Kerber has shown some encouraging signs during this tournament, if Muguruza can continue to find that the balance between aggression and defence, and to come forward when the opportunity arises, I think she will win this match. July 8, 2017 in Kerber, Muguruza, Wimbledon, WTA. I’m not going to vote for either player since they are both head cases and anything can happen. Though it’s frustrating to watch them play, I do like both of them and wish they would get over the apparent malaise they seem to suffer from and become the best they can be. After first week, I just think that Muguruza is getting better and better for the contention. Kerber, Aga and Wozniacki are three lucky girls who get through to the second week because of opponent meltdown. Frankly speaking, I really wish Ostapenko wins again in Wimby this time (if she can). Garbine is indeed getting better as the tournament progresses. Along with Halep and Azarenka. I will give her an edge over Kerber. I just hope she keeps her focus, no need to overpower Kerber, just keep her mind in the game for 2 to 3 sets. Play her tennis regardless of the opposition. So happy for Angie that she won yesterday. I felt like this was a boost of confidence and I think you missed out one aspect in this match-up: The reason why Kerber struggled so much was not only her confidence but the pressure of being the clear favourite on paper as no. 1 in the world. She was always nervous playing players she had to win against. However, Muguruza is another caliber. She is a GS champ, she won the last 4 encounters and she will be the favourite in this match-up. I think this will help Kerber to win it. I truly believe that she will be able to get that magic again. Not saying she is going to win Wimbledon (I hope though 😀 ) but very confident the can win against Muguruza. All valid points, Murphy! I’m sticking with Muguruza and I really like the way she has been playing at this tournament. In other news, i’m disappointed this match is on Court No.2. I thought this was going to be on Centre! Agreed! Bit weird having two recent finalists and Slam champions squaring off on court 2. It has always been like this. Wimbledon scheduling is just sexist and old-fashioned. Who cares if Djokovic, Murray, Nadal and Federer are battering their opponents. The coverage of ATP over WTA always gets to me during Wimbledon and even more so this year because the women’s matches have been the highlights on Centre Court this year. To be fair, the majority of English Wimbledon viewers seem to intensely dislike watching women’s tennis, so it makes sense that they wouldn’t be priority. The majority of the players at my club don’t even have a clue about womens tennis. Yep I understand. Same at my club, women’s tennis rarely gets mentioned and in fact, one person was very critical of it a few years back. Yeah even the female members seem to prefer watching men’s. If it wasn’t for us gays, I doubt the WTA would even have the fan base that it does. Caroline played well tactics wise. Much like the way Garbine beat Anett a few weeks back, she held her defense well. It’s in the way Kontaveit plays. Against strong opposition, she starts up a storm, like a powerpuff girl, and barrels away. As such, finishing the opponent in two sets is advantageous. I knew she was going to lose when Wozniacki survived the second. Woz used her defensive skills to stay with Anett and pick her off. Garbine, likewise, then used her power play to soften Anett’s attacks and came into her own. Experience is the difference. That’s why I said Anett overdoes it sometimes, and when the opponent has weathered her power, you basically have a puff girl left. That needs some work, mentally. I think we all had that feeling when Caro won the second set! Anett has always been a bit nervy, but she has won so many matches this year. I’d like to see her expand on her net game as she doesn’t yet look that comfortable coming forward.